OmniAire 18000 HEPA Negative Air Machine by Omnitec Design Inc. The OmniAire 18000 is our largest portable HEPA air system with 18,000 CFM air flow capacity. The 18000 is a modular air filtration machine with unique versatility for large scale cleanup. The final setup includes a number of filter options depending on your specific project protocols. OmniAire 18000 HEPA is used to purify and re-circulate air or create positive or negative air pressure containment areas. The 18000 is also ideal for large mold, asbestos & lead abatement projects, construction sites, restoration projects, water damage/fire damage clean-up and more. The high powered OmniAire 18000 air filtration system ships standard with a single blower unit, three HEPA cabinets, and nine 99.97% efficient HEPA filters. 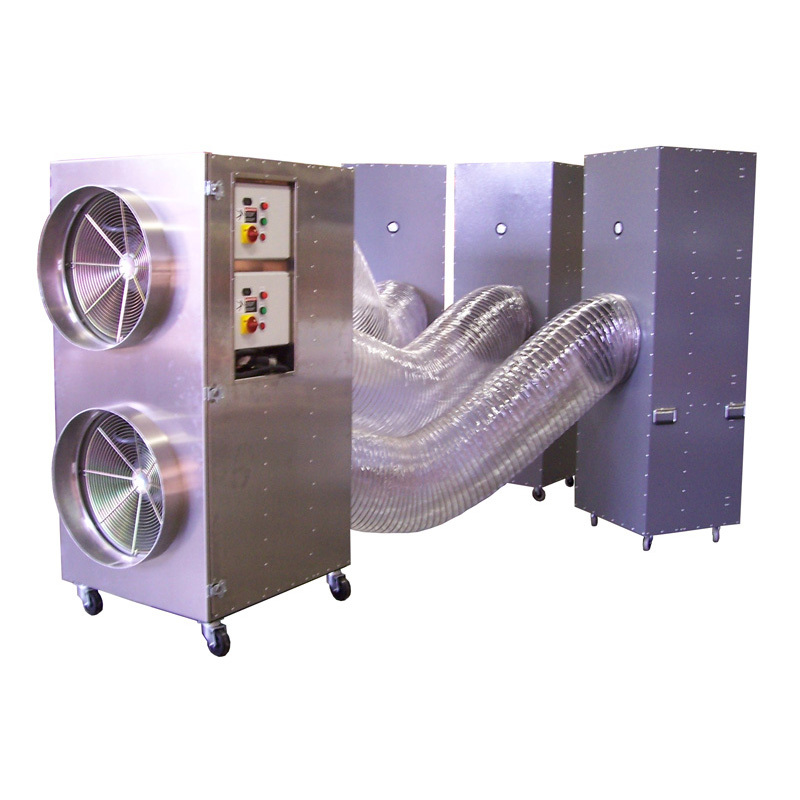 The OmniAire 18000 modular system consists of a blower cabinet and three filter cabinets, all connected by flex hoses. The cabinets are easy to transport and setup is a breeze at various types of projects, including HAZMAT removal jobs. The blower cabinet contains twin 22″ vaneaxial blowers with 7.5 HP motors and controls, and operates on a 480V/60 Hz/3 phase/30 amp power source. The OmniAire 18000’s portable blower cabinet is mounted on 4″ casters, weighing 900 lbs. and is 30″ wide, 72″ high, and 48″ long. The reinforced steel internal frame enables the blower unit to be moved by forklift and by crane. Each filter cabinet contains three filters. The individual filter cabinets each have a differential pressure gauge to measure filter load. Each of the filter cabinets are mounted on casters, weighing approximately 200 lbs. when fully loaded with HEPA filters and measure 26″ wide, 80″ high, and 28″ long. Three flex hoses connect the modular filter cabinets to the blower cabinet. The 18000 comes standard with hoses that are 18″ diameter, 25’ long, with a 10″ WC vacuum rating. The OmniAire 18000 will accept various pre- and final filters depending on the application including HEPA filters, carbon filters, and bag filters, allowing full flexibility, from project to project. The OdorGuard carbon web filters and optional large capacity VaporTrap carbon filters are also available to control odor and VOC’s. The individual filter cabinets can be located in three separate remediation areas while the blower unit remains outside of the containment area, to avoid unnecessary contamination of the blower module. Control of gaseous contaminants, odors and VOC’s, carbon filters are recommended when control of gaseous contaminants, that require a large amount of activated carbon, VaporTrap filters are available. These filters are a disposable V-bank filter containing 36 lbs. of bulk granular carbon. VaporTrap carbon filters can be installed in OmniAire 18000 filter cabinets in the place of HEPA. To control non-hazardous dust, the OmniAire 18000 can be equipped with bag filter housing modules, and MERV-14 bag filters. Our bag Filters are constructed of synthetic, moisture resistant media and galvanized steel separators. The bag filter housing Module can be installed in place of HEPA filter for efficient and economical bulk dust collection. TUV field testing is available for this unit.